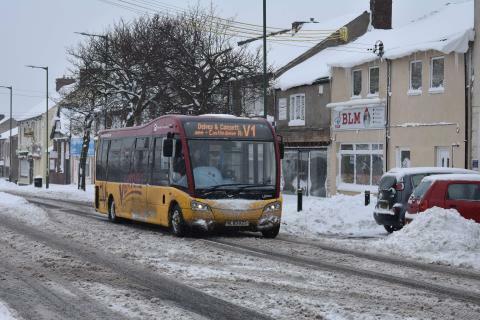 As the Beast from the East - and its later ‘mini’ successor, inflicted disruption upon the region’s roads during February and March, Go North East customers commended the award-winning company for pulling out the stops to keep its buses moving. Providing a 73% reliability rate on the services it ran and keeping its passengers regularly updated on its website, social media and through the local media, customers praised the efforts of team members across the company. Go North East Managing Director, Kevin Carr also gave his thanks for the overwhelming feedback received in gratitude of those working tirelessly, despite the challenging circumstances. Kevin said: “Our social media channels and gonortheast.co.uk saw massive spikes in online customer numbers and as the storm raged its worst on 28 February, our live chat requests and phone-based customer service queries peaked to new levels. To commend its on-the-ground and behind-the-scenes teams’ commitment, Go North East created a special edition of its internal newsletter, showcasing the positive customer comments shared directly and online.